Brussels sprouts. Some think they are the work of the devil. Others sing their praises to high heaven. Me? I don't mind them at all, and can, in fact, be quite fond of them when they are done right. I often cook my Brussels sprouts in a broth over medium-low heat until they're tender and infused with flavours - I find that this keeps them from turning bitter, and brings out their gentler side. I made these orangey, buttery, nutty Brussels sprouts as a side for lunch recently, and while I don't regard it as my best work, the dish definitely passed the I-can-easily-eat-it-all test, so I am fairly content. Simon liked it even more - he ardently pronounced it delicious. Our enthusiasm for the same dish can often vary, and hey, I certainly do not complain when he's more keen on my dishes than I am - it can be a nice boost for the ego, and serves as a nice reminder that taste is a personal thing. Halve or quarter the Brussels sprouts lengthwise, depending on their size. In a pan, lightly toast the pecans until fragrant. Grind together with sugar and half of the orange zest with a mortar and pestle until it takes on a coarse sandy appearance. Set aside. In a saucepan, gently fry Brussels sprouts in butter for 1 minute, turning and tossing them around. Add in orange juice (approximately 1/4 cup), the remaining orange zest, and water or vegetable stock. Let it simmer for about 5 minutes or until just tender. Season with salt and pepper to taste and sprinkle with zesty sugared pecan crumble. I quite like a brussels sprout, but I am sceptical about the crumble with them! I prefer a more savoury treatment. I cooked them yesterday night for the first time! With walnuts! I'd love to try your recipe indeed! Words cannot express the depth of my love for brussels sprouts. I used to just eat them plain, microwaved - that's how much I loved 'em. This looks stellar! Michelle - yes I like both! Brussels sprout crunch and pecan crunch, I'm liking the texture profile there and orange to round of the taste. Looks like a side for a great roast, something I really miss right now. Thanks Winston! Your lovely comments really brighten up my day. Yeah, I'm not really sure why sometimes they're bitter and other times less so, either. Must experiment! Arrgghh.. poison ! Poison!! Hahahahah... 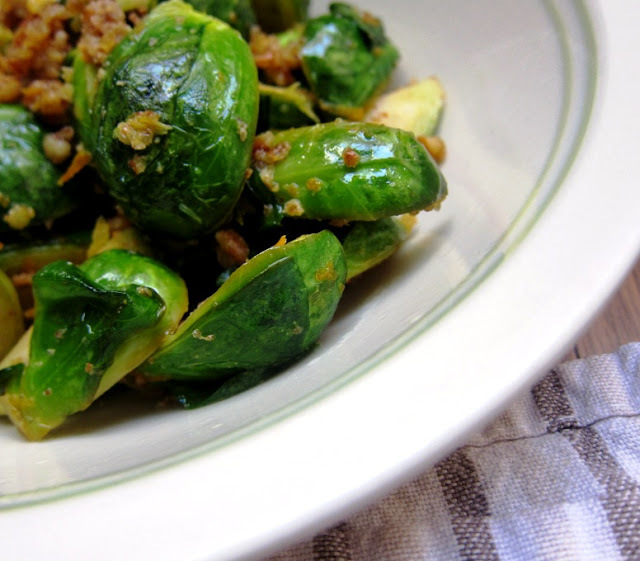 I do recall you were going to post this recipe up and was trying to avoid visiting :P But look, I understand that there are some people who have odd tastes and like Brussels Sprouts, but I still like them (the people, not the sprouts)! I heart brussels to death! well, not to death but I love them long time. Praise to any bloggers who write about the sprout! Really interesting, Leaf! As always I admire your creativity. I'm also a brussels sprout lover... I fell in love with them in Amsterdam - they're really sweet and tender in Holland for some reason. 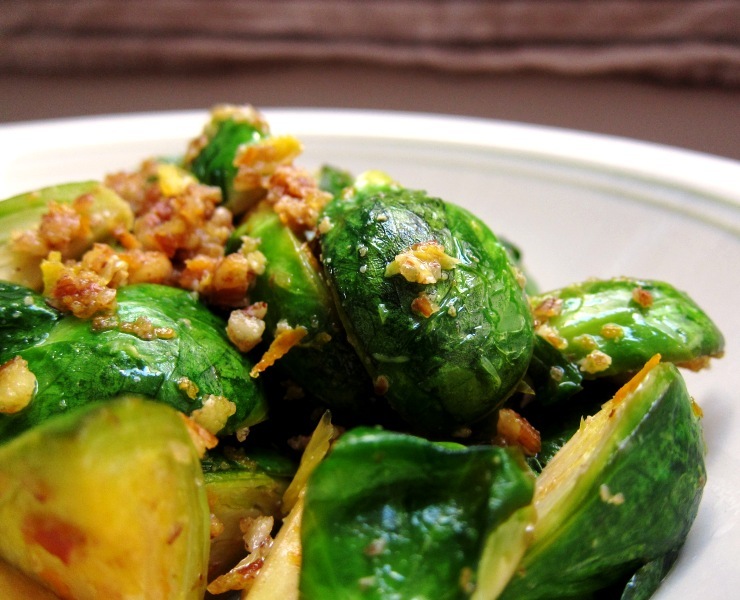 I am always happy to find a new way to enjoy Brussels sprouts, and this looks like a keeper! I would love to try this dish, but my partner won't touch brussel sprouts with a 10-foot fork, lol. I'd love to try it with another vegetable though, maybe carrots? Thanks for visiting my blog! This dish sounds delicious! I've had some bitter sprouts, but I think I've managed to avoid the really, really horrible ones that you speak of, tigerfish, and I must say for that I'm grateful! Thanks Jasmyne, would your partner eat asparagus or broccoli? I think either of those could work here as a replacement for Brussels sprouts. I love brussels sprouts! I know most people don't but what's not to love about a chewy little cabbage? I've never fixed them in a sweet way like this before but It sounds liek a luscious combination! I'm a huge fan of brussell sprouts - what a great and easy way to add some nutty sweetness to them! I am ahuge fan of brussel sprouts!! I simply adore brussels sprouts. The dressing sounds sweet and tasty - thanks! I have bad memories of brussels sprouts... but your dish looks amazing! This is on my list of must makes! !